You are fascinated by this kind of sport, you admire every winter Michael Greis and the others and you want to get to know the first tips and tricks of the professionals in order to raise your fun on the biathlon sport? You can experience the sporty combination between cross country skiing and shooting yourself at a biathlon workshop. The first hits on the target and you do not want to stop, join our one day workshop. Whether it is winter or summer you can experience this feeling all year long, the only difference is the equipment: in winter you will have skis on your feet and in summer roller skis. 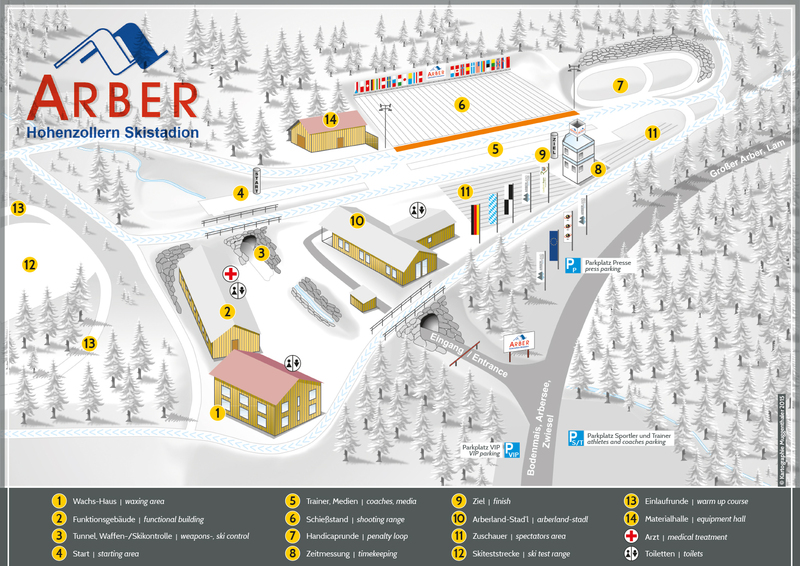 You want to enjoy competition atmosphere or you want to take part in a biathlon competition. A two days workshop in winter will put the finishing touches. In addition you get many hints from biathlon coaches and international judges of the biathlon sport. You need sport clothes according to the weather conditions. Registration at Schneider Events, times after arrangements. Equipment for rent directly at the stadium; 10 Euros per person and equipment.